Updated Sunday January 27, 2019 by Steve Greene. HBA has been an active member of our community for more than 50 years providing recreation, fun, teamwork, and great memories for Hilliard's kids since the 1960s. 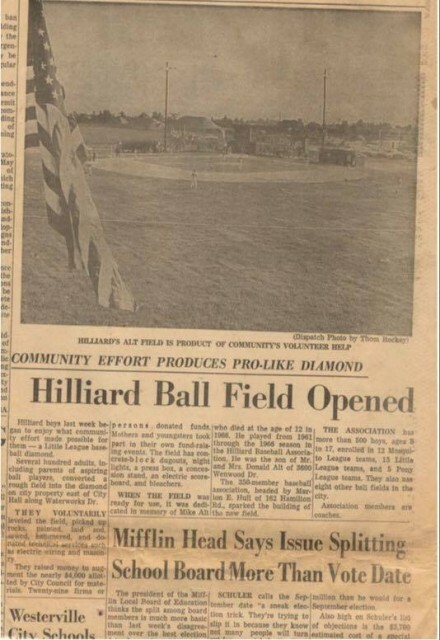 This year we are celebrating the 50th anniversary of Alt Field, built by HBA parents and volunteers on a former trash dump, and seen here in an article published by the Columbus Dispatch on June 15, 1969. We are lucky to have had so many great volunteers that have cared for the field over the years. Also thanks to Hilliard Rec and Parks for making the land available and contributing to improvements over the years - all for the kids of Hilliard!